Manchester City midfielder Kevin De Bruyne sustained ligament damage in the Carabao Cup on Thursday night and will be out for 5-6 weeks. The 27-year-old was forced off with three minutes left of the Citizen’s 2-1 win over Fulham and underwent scans on the issue on Friday morning. The Belgian superstar had only just made his return to action following a significant layoff due to a knee injury he picked up back in August and this latest news marks another huge setback for Pep Guardiola. 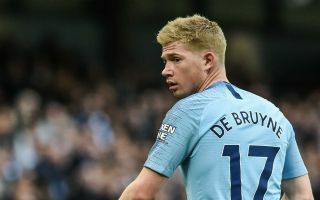 According to Manchester City’s official website, De Bruyne has suffered knee ligament damage once again and the Premier League champions will now be without their star player for at least 5 weeks. The win against Fulham marked only his second start of the 2018-19 campaign and now Guardiola must prepare for life without him just as their busy winter schedule starts to pick up in all competitions. City are joint top of the Premier League after ten matches alongside Liverpool and will play Southampton next at the Etihad on Sunday. Guardiola’s side have coped with De Bruyne admirably up to now, due to the fact they have such amazing strength in depth in the middle of the park, with the likes of Bernardo Silva, David Silva and Ilkay Gundogan all capable of filling the Belgium international’s spot. That being said, City are never better than when De Bruyne is fully fit and driving them forward, meaning this latest blow for the Manchester giants is actually a huge boost for the rest of their title rivals.